Craft room organization doesn’t have to be expensive. Instead of buying shelving units and storage cabinets, think about furniture you may have around the house that can be recycled for the craft room. For some reason, I have quite a few furniture pieces that were handed down to me. I think that back when we were first married I was accepting anything that was offered to me! Luckily, I held on to these pieces because now they are perfect for organizing my craft room. 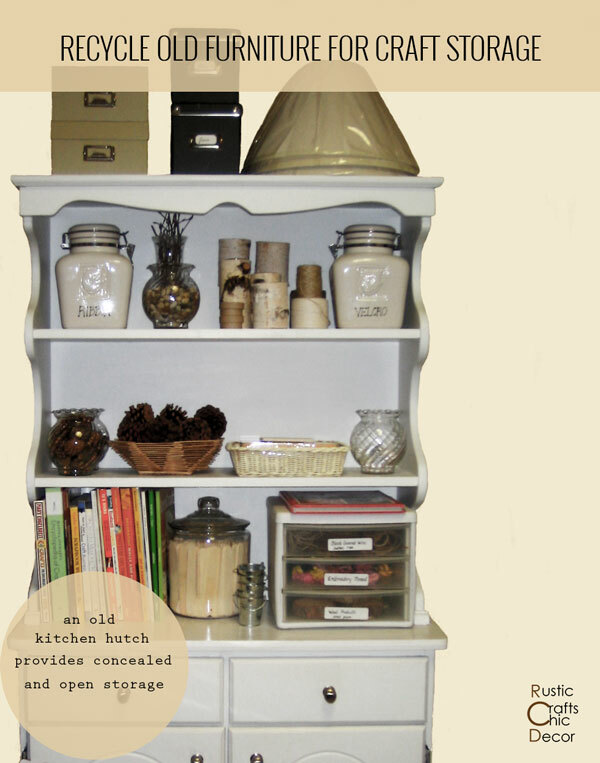 For example, this old kitchen hutch provides both open shelving and hidden cabinet storage. Take a look at what furniture you may have in storage! Sitting on top of the shelf are two kitchen canisters that I don’t use anymore in the kitchen. I now use one for ribbon and the other for velcro. The cool part is that they each have an embossed leaf on the face of them. 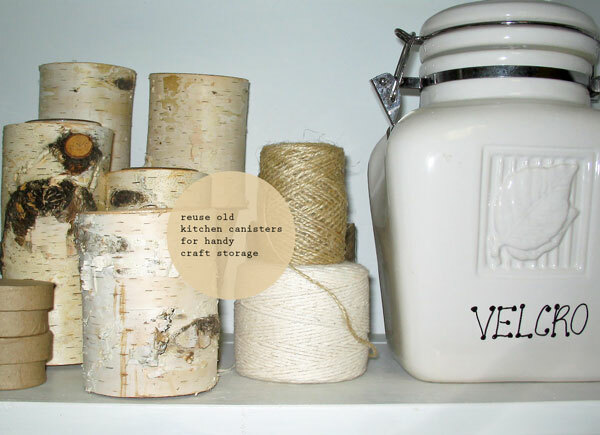 Since I have many rustic supplies in my room, these canisters fit right in. I have several glass bowls throughout the craft room filled with stones, pinecones, buttons and beads. These were left over from centerpieces that I had made for my daughter’s graduation open house. I can see all of my items clearly and I don’t have to store away the glass bowls. Think about what glassware you might have around the house that could store small craft supplies. The mirrored shelving unit on the wall was passed down to us from my husband’s grandparents. I wasn’t sure what to do with this antique. The wood wasn’t in perfect condition so I didn’t feel bad adding some paint to it and hanging it up in my craft room. 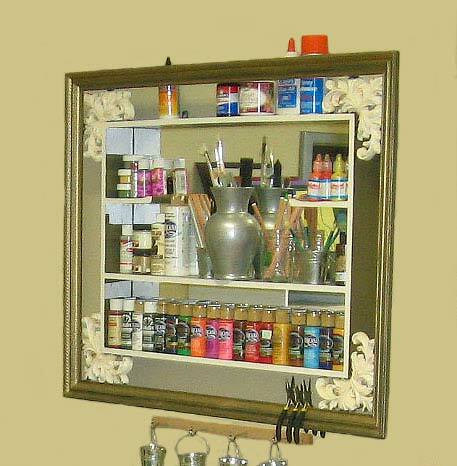 It is perfect for storing small containers of paint and brushes. Before throwing out any old shelving or furniture, think about what kind of storage use it could have. Maybe all it needs it a little paint or hardware change. I have an old stereo cabinet from the eighties that I didn’t quite know what to do with. It hit me one day when I wanted to move all of my fabric to a more visible area. The glass sides and door, of this cabinet, allow me to see all of my fabric patterns at a glance. I hung a length of wood underneath the shelving unit, with some hooks that I had attached, and hung small tin pails to hold bead accessories. The tin pails were also left over from the graduation open house. I had originally purchased the tin pails from Oriental Trading for a great price. It may be a good idea to just purchase these for small items and make your own hanging system like I did. This credenza was also given to us and yes I also painted it and changed the hardware. 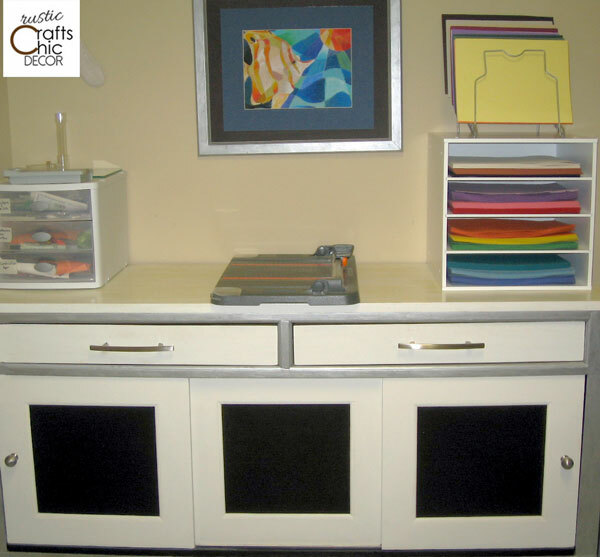 I don’t know what I would do without this credenza for my craft room organization. The storage space it provides is such a life saver. 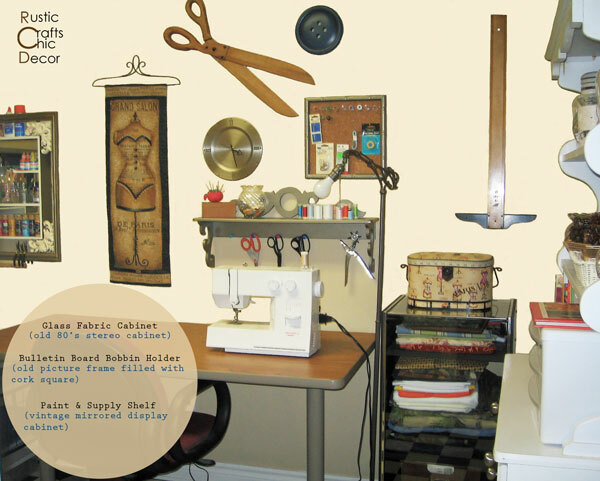 I have a place for all of my paper, stickers, albums, cutters – all my scrapbooking supplies. Plus, the inside of the credenza has pull out shelves. The hutch was bright yellow and the credenza had a walnut color stain. By painting all of the furniture, I get a more cohesive look. I also changed out all of the cabinet knobs and drawer pulls to match each other. This craft room cost me almost nothing because almost everything is old. Basically, three of the storage bins are new. It just shows that you don’t have to spend a lot of money to organize. I absolutely love your ideas! You have an amazing craft room!!! Thank you for sharing! Awesome tips. I am following you via Whimsical Wednesday. I also like recycling pieces and see if they could be used in a different way and look chic at the same time. Thanks JT! It is a good feeling…saves money too!